This week the Philadelphia Folksong Society presents the 55th Annual Folk Festival at the Old Poole Farm in Schwenksville, Pennsylvania. One of the largest and oldest running musical events in the United States. “Fest” is much more that a concert to a great many of dedicated attendees. This will be my 41st year in a row attending the festival. The 31st year in a row for my wife of 26 years, I brought her to her first festival. My children ages 17 (18th), 21 (22nd), and 24 (25th) carry on the tradition. Often three, even four generations can boast long consecutive streaks, surpassing ours. A point of pride – “I was 1964!” Says one. The crowd is as eclectic as the definition of folk. Octogenarians committed to Old Time Blue Grass, teens hot to see The Decemberists or Tedecki Trucks, families with young kids watching Give and Take Jugglers or hitting Dulcimer Grove for some Arts and Crafts; avid dancers at the Lobby Dance Stage. Off the grid folks who look like they live on the farm all year long, suit and tie executives who show up in kilts or fatigues for 5 days alternative to their other lives. Music runs from Tibetan Throat singers, to Dave Bromberg, Los Lobos is a highlight this year, Arlo Guthrie, traditional and rocked out Irish music, Singer-songwriters, Cajun/Zydeco, African, Japanese, Guatemalan, Indie. Folk music can be defined as music that originates in a popular culture so it transcends nations and can be Rap or the Appalachian sound that so many associate with the name. Having served 6 years on the Board as Treasurer and Vice President, and 41 years as a volunteer – from a line worker to Committee Chair, I have seen this unique event from many angles. While music is at the core of this event it is so much more for so many. 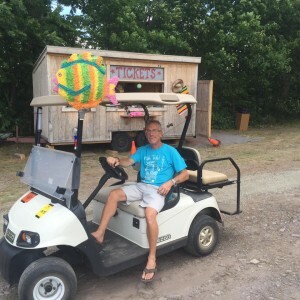 At our campsite (the campground draws 5,000-6,000 campers beyond the 30,000 or so day trippers) – one of a large number of established destination sites we have had a core group that returns each year to camp together for 40 years. Folks return from Maine, Hawaii, Ireland, St. Louis, California – often the only time we see other in the year. When we started there my friends and I were 17 years old at the time, now we have kids in their 30’s and grand-kids as old as 10. Many have never missed a year themselves. We are ‘Good Space Grove’, other camps, Fish, Philly Jug Band, Lord Mt Batten, Aurora Borealis, Azzholes, Havoc Headquarters, Thunder Dome, Hoagie, Club Ned, Whairntville, Bob’s Country Bunker are equally well established. After the fun on 6 stages ends, people return to the campground. Each of these sites and many more are a mecca to musical jams of all genres. Blue Grass in one, Grateful Dead in another, sultry ballads, Phil Och’s still alive in yet another. Masses of people wander from camp to camp, dragging upright piano’s, double basses, well-worn guitars and the jams are incredible. Often the feature performers from Main Stage will join in at the campground jams that last from mid-night until 4:00 am. What brings people back year after year one might wonder? For some it is the reunion with old friends, or a chance to make new ones. Fest is a community, a thriving village with 3,000 volunteers who build buildings, provide security, feed people, run six stages, two MASH tents, Park 10,000 cars and 500 Recreational Vehicles. If you look hot, you will likely be handed water; tired, a ride in a golf cart or ATV; lonely, a hug from a stranger who is not one since you are there. Just arriving makes you part of the family. Stop on by!